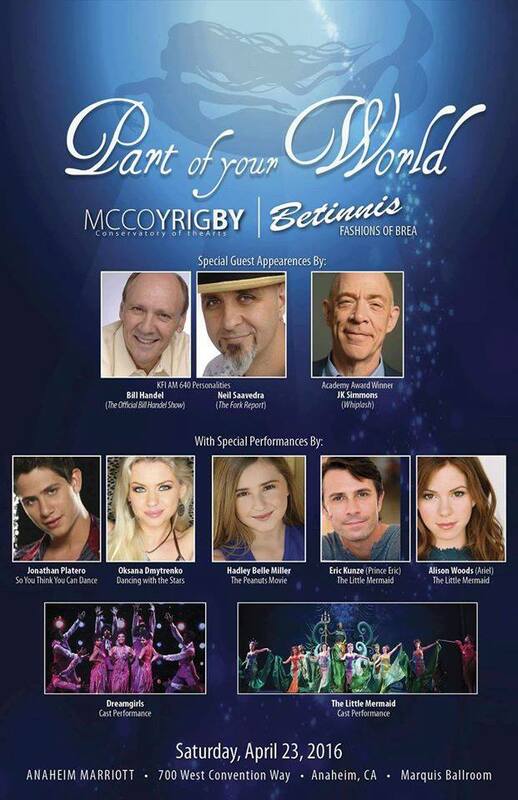 Eric will be performing in Part of Your World, a Gala Fundraiser for McCoy Rigby Conservatory of the Arts on Saturday, April 23rd in Anaheim, CA. Tickets are available here. "The role of Prince Eric is expertly performed by Eric Kunze, who even looks like the charming Disney prince, with his costume and hairstyling. His ethereal voice resonates so sweetly, it’s no wonder Ariel falls for him! Kunze first captures the prince’s vitality as he expounds on the glories of a life at sea, chasing the voice on the wind. Then, he brings a gentle warmth to his scenes with Ariel, as he teaches her how to communicate through dance. " "Alison Woods’ radiant Ariel and Eric Kunze’s magnetic Prince Eric headline a superlative cast that sings, dances and “swims” the delectably hummable score from Alan Menken, Howard Ashman and Glenn Slater, as fins flap silently against a rippling ocean backdrop."